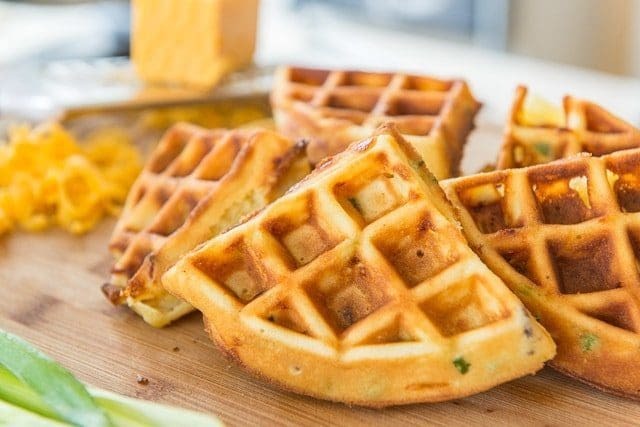 These savory Bacon Cheddar Waffles are a recipe I first tasted at an event hosted by Chef Josh Capon, and I got the recipe to share with you. They’re mighty delicious and dare I say better than a sweet waffle! While I definitely enjoy a sweet waffle with butter and maple syrup, I like savory waffles even better. 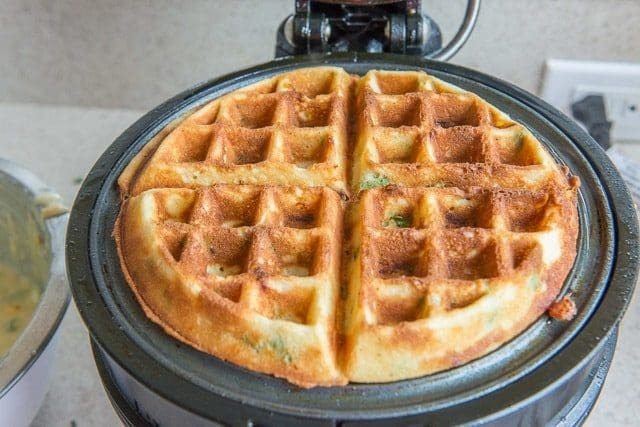 These Bacon Cheddar Scallion waffles are my go-to, and they’re by a brilliant chef by the name of Josh Capon. Chef Capon made these waffles at an event I went to last Thanksgiving, and I was ecstatic to get the recipe. If you don’t know Chef Capon, he’s known for some excellent restaurants here in NYC, for winning the NYCWFF Burger Bash a few times, and you may have seen him guest judging on Food Network’s Chopped before. When I first made these waffles, I was startled to see how much butter is in the recipe. But, I’ve never felt compelled to try cutting down the butter to see what happens. They’re so good I don’t want to mess with them, and if you’re going for low-fat waffles anyway, this is not where you want to do it. 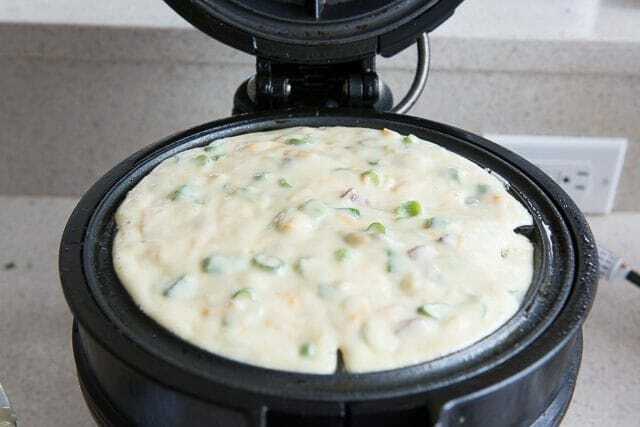 The waffles are full of sharp cheddar cheese, smoky bacon, and scallions. Each bite has a ton of flavor. 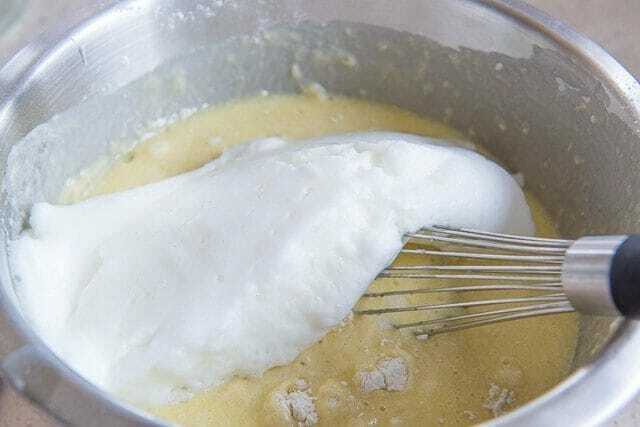 I always take the extra couple minutes required to whip egg whites and fold them into the waffle batter, as it results in a much lighter waffle. If you’ve seen my 5 Secrets to Crisp, Flavorful Golden Waffles post, that’s one of the 5 secrets. Then, make sure to put the waffles in a 200 degree oven for at least a couple minutes, directly on the oven racks, so they can crisp up and release more steam. This will also keep them warm while you make the other waffles. Enjoy! PS Since I always get asked, this is the waffle iron I have. It’s definitely an investment, but it’s fantastic quality, and you can make two gigantic waffles at once. Beware though, it is HUGE! 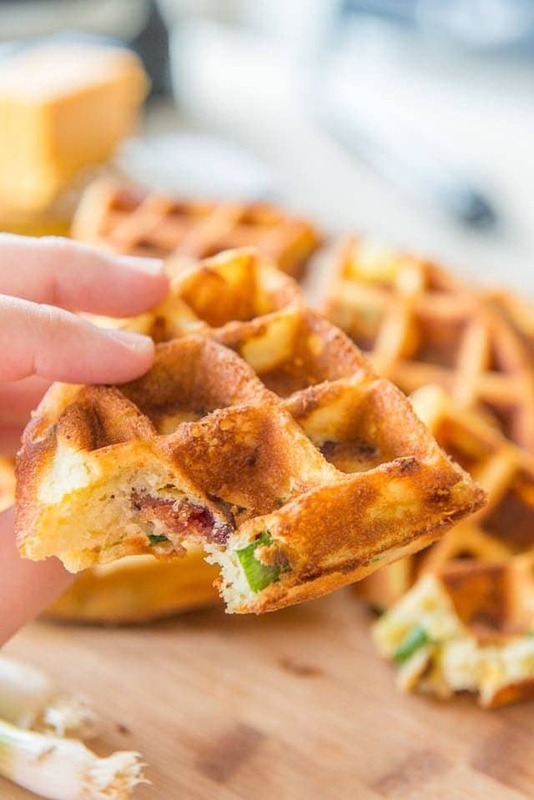 These Savory Waffles have cheddar, bacon, and scallions as the star ingredients. They are a total treat for brunch! Preheat your waffle iron. Mine only has one setting anyway, but you want the iron to be pretty hot. 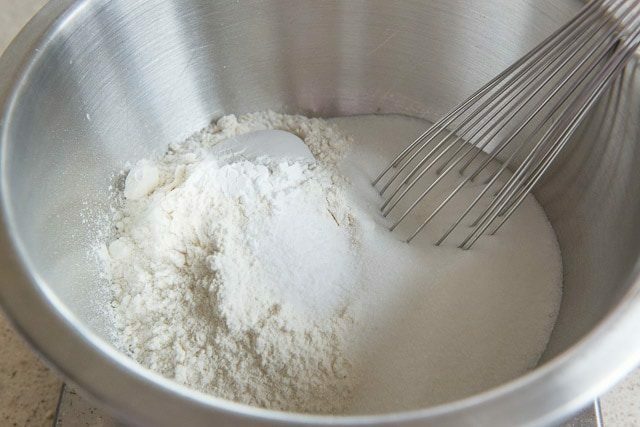 In a large bowl, whisk to combine the flour, sugar, salt and baking powder. Set aside. 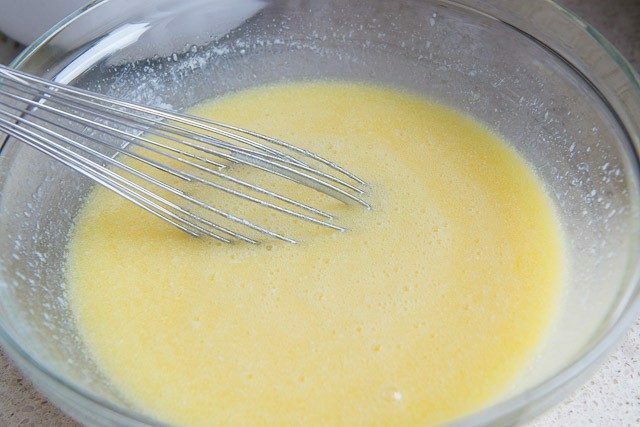 In another bowl, whisk to combine the egg yolks, milk, and butter. Set aside. 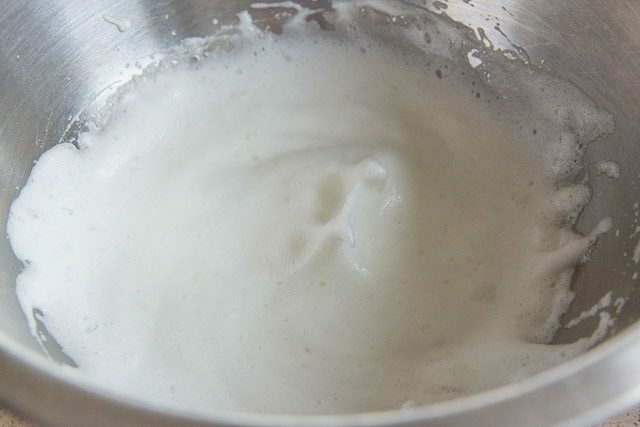 In a large (and very clean) bowl, use a hand mixer to whip the egg whites to soft peaks. Add the wet ingredients to the dry, and mix until they are almost combined. 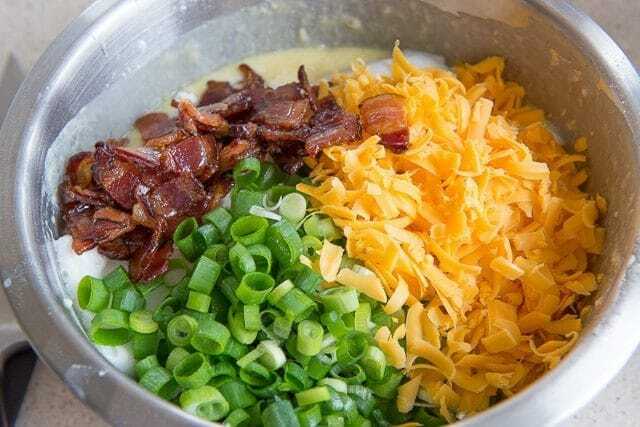 Add the egg whites, bacon, cheese, and scallions to the bowl, and gently fold them in until combined. Portion the batter into your waffle iron (the amount will vary by waffle iron, but I use about one cup per waffle), and cook for approximately 5 minutes, until golden brown. When the waffle has finished cooking, place directly on the wire rack in the oven, to let the steam escape. Finish cooking the remaining waffles, and enjoy! 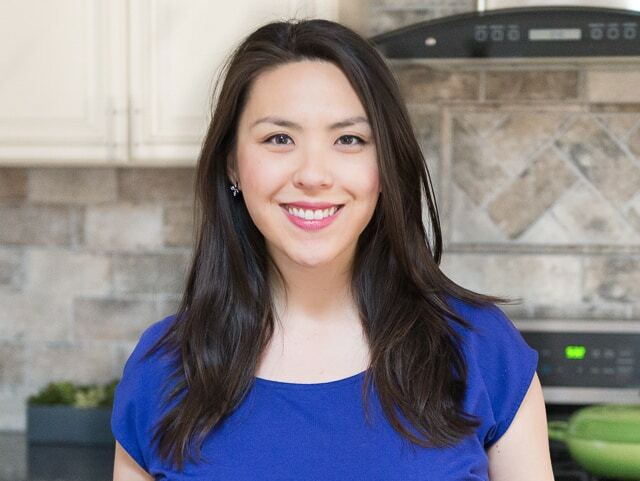 *Here's a post on How to Cook Bacon in the Oven, which is my preferred method! This looks Soooo good! Never had savory waffles before. How are they served/eaten? Plain, syrup, something else or all by themselves? Kinda like a chinese scallion pancakes but waffle style! BTW, your carrot cake was two thumbs up from the hubster buster. He said it tasted like a carrot cake, too. The topping syrup was the crown on the pancakes. I will make that one again. This one…I will give it a try after a long bike ride. Cheers! These look so good! 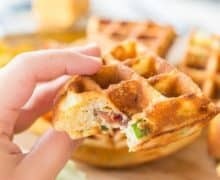 I’ve made bacon cheddar waffles before but never thought to add scallions, gonna have to try it! One thing I do is add the bacon and cheese on top of the batter rather than mixing it in, it puts a crispy cheesy crust on one side of the waffle =) then top with brown sugar syrup. These are really indulgent but so worth it. The flavor is amazing! These have to be THE BEST waffles I have ever made One thing I found was mixing the melted butter with cold milk caused the butter to harden which didn’t cause any problems but I think when I make them again, I will warm the milk up a bit.